AjaxPro extension helps you deliver a better user experience. Let to customers add to cart, wishlist and compare products without page reloading. The extension is the easiest way to create fast and dynamic pages in your magento store. Quick update and immediate redirection always will stand you in good stead in improving your store usability. Find out more information and reviews about our module at Magento Ajax Pro extension page. Makes shopping at your store easy and quick. 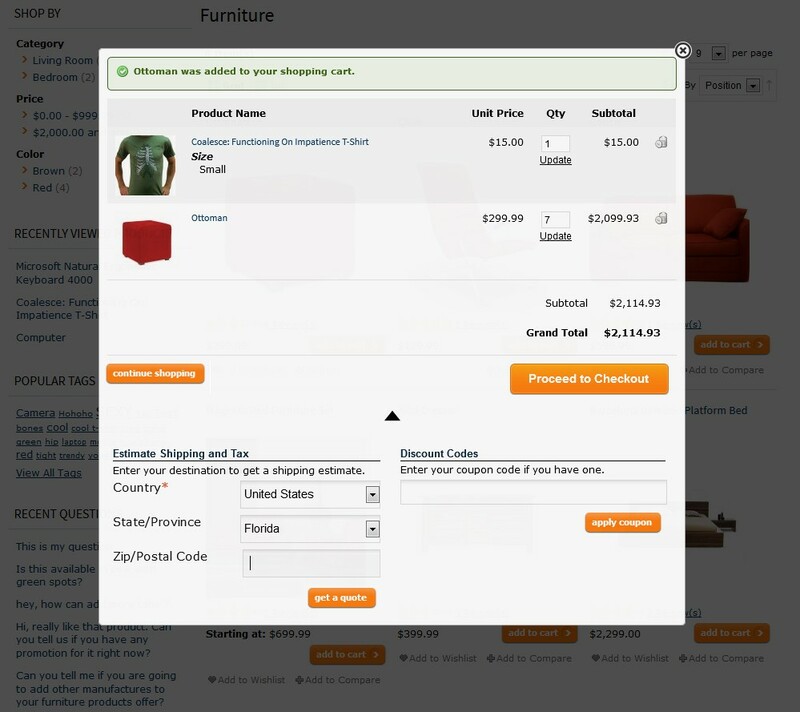 Allows your visitors to add products to the cart and edit shopping cart content faster. Forget about slow page reload. Improve your store design with ajax shopping cart block and bring your shopping experience to a new level. Supports all actions for catalog compare and wish-list via fast AJAX actions. Forget page by page catalog surfing. Ajax pro allows you to auto-load category product when user is scrolling to the end of the page. Improve your store design with login form available on every page of your store. AjaxPro extension delivers amazing user experience to your customers. They can add to cart, wishlist and compare products without page reload. A must-have extension for every ecommerce website. Try our extensions and choose one to be fully suited to your store’s target customers. After switching our Magento to a new template the extension was not working 100%. The tech support responded quickly and solved the issue(s) fast and professional. So 5 stars for the service level! Excellent extension and BEST support ... Well recommend Templates Master!! Very nice extension and very good support team!!! There's a requirement from these kinds of extensions for quality and speed to be worth it over the default Magento configuration. This extension from Templates master provides both! my store is now much more pleasurable to use. Best support there is when it comes to magento extensions. Whenever I have to choose between two extensions with the same functionality, I choose the one from templates master.. The extension is very well written and easily customizable. When you are stuck, their support just rocks! Fast, responsive & excellent developer support with alll requests. Can't recommend highly enough! Will continue to buy from Templates Master where possible. Highly recommend! We've bought a lot of extensions from TM and others, and these guys stand above. Their support is simply fantastic. Not only did they help customize integration with a custom theme for no additional cost, which was completely unexpected, but they went above and beyond offering to help style and organize layout. Beyond that, they support your with upgrades for a 1 yr, whilst others may do 30 days or a few months, and everything is coded really well and easily to follow. This company gets top marks! Purchased many extensions/themes, their customer service is the best I have experienced even with modifications to files many months after purchase. Templates Master is number one! Very good extension and EXCELLENT support. View all reviews for Magento Ajax Pro 3.3. 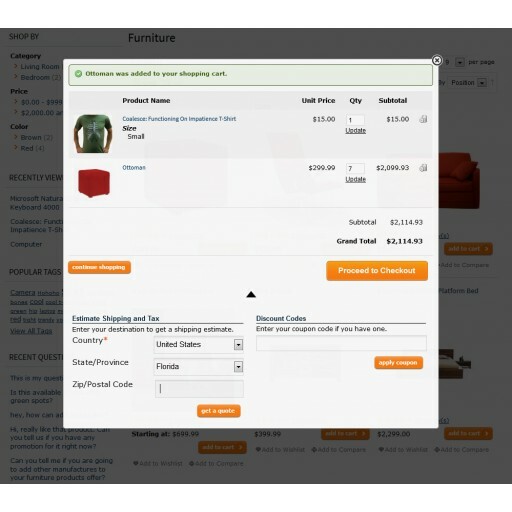 Improved handling of Magento messages after adding product to cart when Stock Inventory is enabled. Additional content at bottom of login popup via xml "ajaxpro_customer_login.form.after"
Include calendar css with media="all" param on homepage. Fixed missing JS resources on home page for ajax actions (add to cart, add to compare, add to wishlist). A: Our extension create links only for action urls. This urls can be accessible with recent Google technologies but i don't think that it will benefit SEO to much. Ajax Pro will not create any duplicate pages problems for sure. A: Right now we have not noticed any SEO problems with our extension on thousands of stores where that extension is installed at. As far as i can see there is no duplicate pages creates and no other SEO errors caused. Q: hi, is there an option so i can create a multiple wishlist? with the same functionality? A: Sorry what do you mean multiply wishlist? A: To enable the user when click on add to wishlist to create a wishlist list or to choose already created wishlist.the user then will be able to create/delete/modify a multiple wishlist. A: Yes i mean multiply wishlist. If not can it be integrated with other extension that support this feature? A: Sorry but that isn't default magento option and you need custom extension to allow multiply wishlist. Also after that our extension will require modification in order to support multiply wishlist. A: Yes it works with all products type right now. Q: Hello, 3 questions: 1) Can the pop up be disabled for simple products, so that the item is just added to the cart, and the cart updated, but no need for the customer to click 'continue shopping'? 2) How are configurable products dealt with? Ideally I'd want the simple products to just add, as in my question 1, but configurable products to show a pop up to let the user choose the option(s) they want, with an 'add to cart' type button, all ajax, obviously. 3) There appears to be an ajax delete button for each item in the cart, would it be straightforward to add a +1 and a -1 button to? 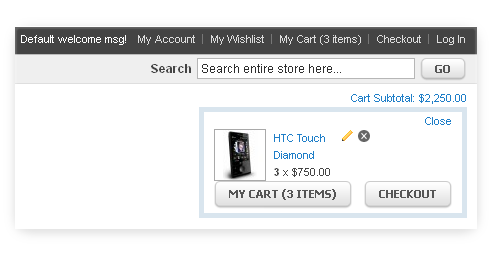 Clearly if quantity was only 1 and someone '-1'd then it would delete the item from the cart.Thanks. A: 1) Yes. 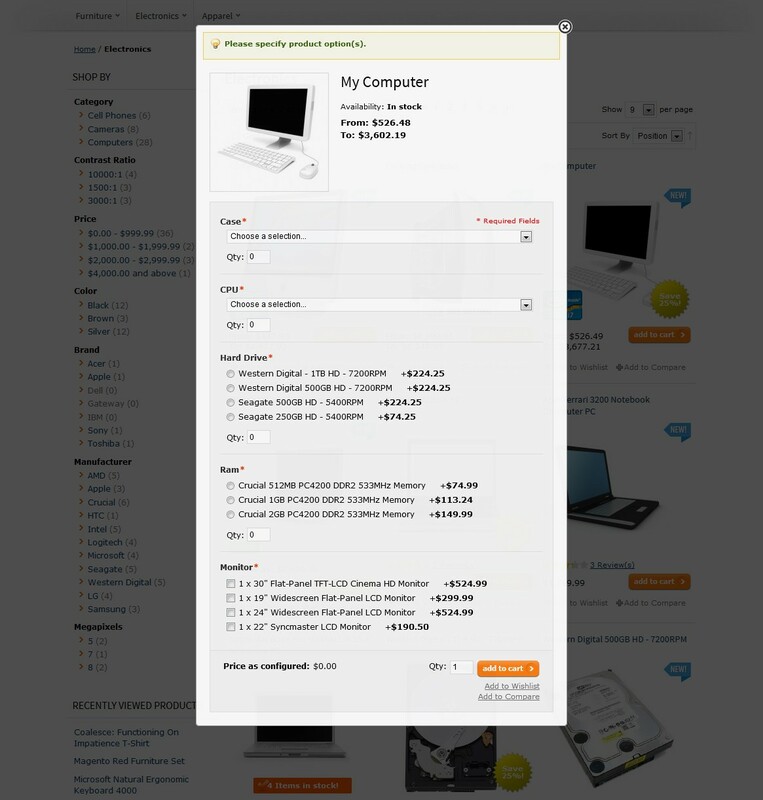 2) Yes configurable products option will be selected in pop-up. 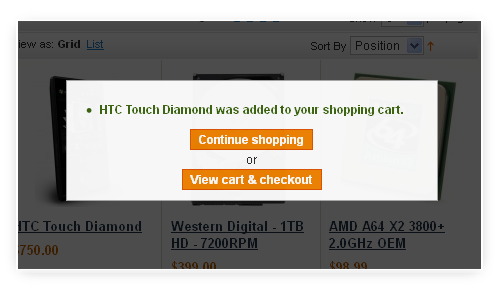 3) Sorry do you want add additional buttons to increase and decrease quantity of items in cart by 1? Q: I installed it step by step from you instructions and I have Configuration > Templates-Master > AjaxPro but when I click on it I get "404 Error Page not found". A: Can you tell us what is your magento version? Q: Hello,Is this extension compatible with Magento Enterprise 1.9.1? A: Thank you for your interest. Right now we are not testing our extension with Magento Enterprise 1.9.1 but some our clients use it without any problem. A: Unfortunately it isn't possible to do in current release. A: Such changes can be applied as custom changes right now. We will discuss if we can include it in next extension releases. A: Can you tell us what version of Ajax Pro do you use? A: Can you contact our support at http://templates-master.com/helpdesk. Our developers will check what is wrong. Q: Hi,Where can I translate "more products" in ajax product listing, when used with button, not scroll. I cant find it anywhere, and inline translation dont work on this button. A: You can translate it at app/locale/YOURLOCALE/tm_Ajaxpro.csv file. Q: Can i add easy banners to the pop up ? A: We are going to add that feature in next extension release. Q: How to add the cart subtotal and popup login form to a custom template? A: Sorry but that will require quite serious changes to extension files. But we are planning to add such changes in next extension release. A: Such feature will require extension modification. A: Sorry can you send us link to your store so our developer will check what is wrong. It 's definitely should not work in such way. A: Hi, To what email can I send you the url? Q: Is it possible to fade out the background when the message is displayed? I already bought this extension but i turned it off becouse it was not totally clear what to do with it. If the background fades it will be much better. A: Yes it's possible in recent extension test version. Please contact our support team and we will send it to you. Q: BTW, the "demo" website you link to from this page doesn't actually have this extension functioning. A: Sorry what exactly feature you are referring too? A: We have not tested this extension with enterprise Magento ver. 1.9. but some our clients use it without any problem. Q: Regarding one of the existing questions:Hi, it worked like a charm until recently, I checked it on my home page products grid and it said "product not available".Still works fine on the product page though. I don't remember what I've done, I just know I didn't touch anything in the extension folder.... ThanksWe have the same problem. Our shop runs since 3 weeks without any problem. Since yesterday evening the problem occurs. I have checked and the reason is a broken url withint the view.phtml. A: Please contact our store support. We will check what exactly is wrong. Q: When you are in your shoppingcart and ad an cross-sell the popup also apears, is it also possible to leave it out when you are in the shoppingcart so that there will be no popup in the shoppingcart?